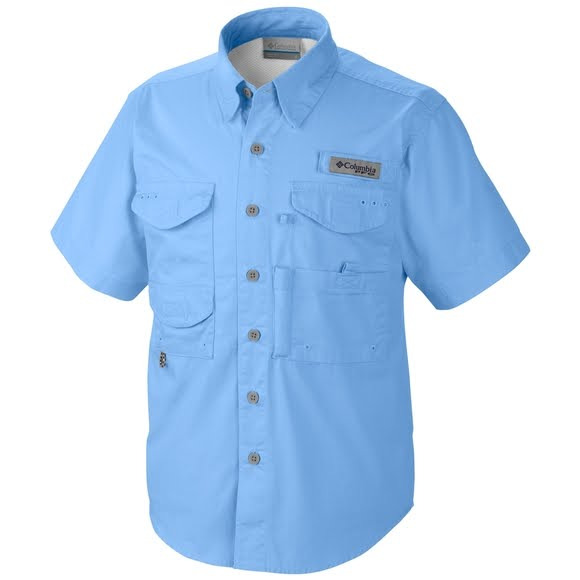 The fish might be smart, but Columbia's most popular fishing shirt is smarter. Constructed of cotton poplin that's garment washed for lived-in comfort, the Bonehead Short Sleeve Shirt features hook and loop closed fly box pockets at the chest, a tool holder and utility loop, and a rod holder loop left chest that frees up your hands to work with lines and lures. The fish might be smart, but Columbia&apos;s most popular fishing shirt is smarter. Constructed of cotton poplin that&apos;s garment washed for lived-in comfort, the Bonehead Short Sleeve Shirt features hook and loop closed fly box pockets at the chest, a tool holder and utility loop, and a rod holder loop left chest that frees up your hands to work with lines and lures. Mesh-lined cape vents at the back shoulder keep you cool and comfortable; hook and loop at the collar tip lets you turn the collar up to keep the sun off your neck.